What are Windows Live Essentials you might be asking? Well with the recent launch of Windows 7, we can see that Microsoft has really done many things right with the latest version of their Windows operating system, such as tweaking the existing code from Windows Vista to make it run a whole lot better on the same and lesser hardware specifications, however perhaps they’ve gone a little too far and they also took some software out! Now I’m not so sure that Microsoft did the right thing in removing the bunch of programs from Windows 7 that now make up the Windows Live Essentials suite of applications, that you can then install separately into Windows 7 for free – now obviously they’ll be some people who would never actually use them if they were shipped as part of Windows 7, but what about all those people out there who receive their new computer and then only use the software that comes on it unless they specifically buy a new software application from a shop? Well, these people might never know how useful these free Windows Live Essentials applications could be; in fact, people may actually go out and spend money on expensive alternatives simply because they don’t know that this free suite of programs is available. It’s taken quite a while for me to even learn of them, so what hope do the regular non-techy people in the street have? With that in mind, here at Zath, we thought that it might be useful to provide a comprehensive review that covers all of these free Windows Live Essentials applications to raise awareness of their existence and show people exactly what they can do with them. So here’s what you can expect to find in this “essential” suite of programs that somehow got stripped out of Windows 7, clearly somebody didn’t think they were as “essential” as their name suggests, but perhaps you’ll think differently once you read about them below. 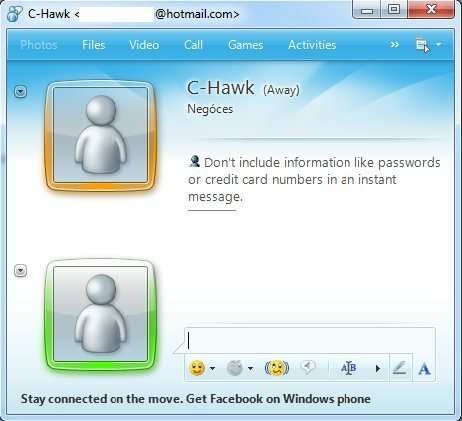 When I first installed Windows 7, it somehow felt incomplete without MSN Messenger waiting for me in the start menu. In fact, the first thing I did was download it as part of the Windows Live Essentials package from the Microsoft. If you’re not aware of it, Windows Live Essentials is a collection of applications including the ever popular Windows Live Messenger, Microsoft’s instant messaging application. Also included in the package are applications such as Live Mail, Photo Gallery, Movie Maker and Writer – all of which I’ve been running on Windows 7. I’ll review the package in several articles, starting with Messenger. Compared to the Windows Messenger you can find within install of Windows XP, Windows Live Messenger is quite an advancement, having gone through many changes (and names) over the years. When you log in to your Windows Live account, you’re presented with a list of all your contacts, just like in previous versions, with a few visual refinements. You’ll find that Live Messenger is still ad-supported, with an ad at the bottom of your main contacts screen, although this didn’t bother me too much as it’s discretely placed at the bottom of the window. A nice visual touch is the colour of the display picture square on your conversation window, which changes with the status of whoever you’re speaking to. If they’re online, you’ll see a green outline; if they’re busy you’ll see a red outline and if they’re away, you’ll see an amber outline. 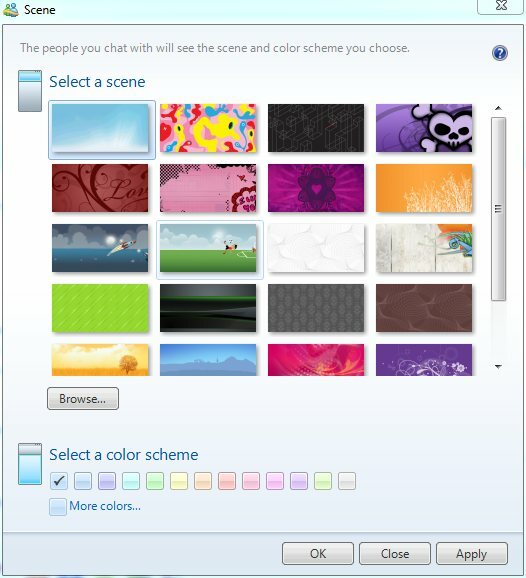 Just like previous versions of messenger, you can change the theme of your window, or “change your scene” as Microsoft likes to say. To do this in Live Messenger, you can roll the cursor over the top right corner of your screen and click to select a new scene. As well as the visual improvements that come with Live Messenger, if you’re using Windows 7, you’ll see added functionality via the new taskbar. If you hover over the icon you’ll see all open windows and conversations, and if there are any conversations that need your attention they’ll glow orange. In addition to this, of course, you’ll also be able to take advantage of the various Aero features in Windows 7. Testing on XP, Vista and 7, it seems to be a very stable application and a welcome upgrade over previous versions of MSN that I’ve used over the years, with all of your contacts displayed in an easy to see way and the traffic light colour scheme for your contacts’ status so you can see at a glance the status of everyone in your contacts list. 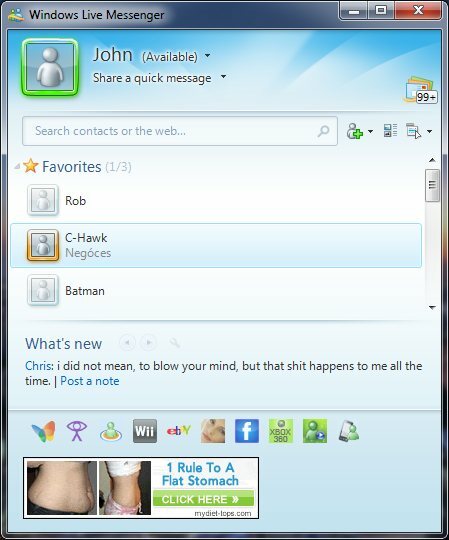 Overall, Windows Live Messenger is a great improvement and I continue to use it to stay in contact with everyone! When you download Windows Live Essentials, you won’t find a calendar application or even an address book application. What you will find, however, is Windows Live Mail, which covers not only your e-mailing needs but also comes with calendar and contacts functionality. To switch between Mail, Calendar and Contacts you can select which function you wish to use in the bottom left-hand corner of the screen. If you open Calendar, it opens in the current window, but Contacts opens its own window, which I found a little strange and inconsistent. The mail section of the application provides you with a consistent and familiar layout similar to other mail clients. On the left, you’re presented with a sidebar containing three categories: “Quick Views” where you can view all unread e-mail and feeds; all the mailboxes of the linked account and the “Outbox” section. You can also add another e-mail account from here, as well as select different functions from Mail, Calendar and Contacts. In the middle of the window, you can view all the messages in the mailbox you’ve selected to view, and when you select a message, it appears on the right-hand side of the window, making it simple to use and easy to read. If you want to compose a new message, you can do so by selecting “New” from the menu bar at the top of the window. 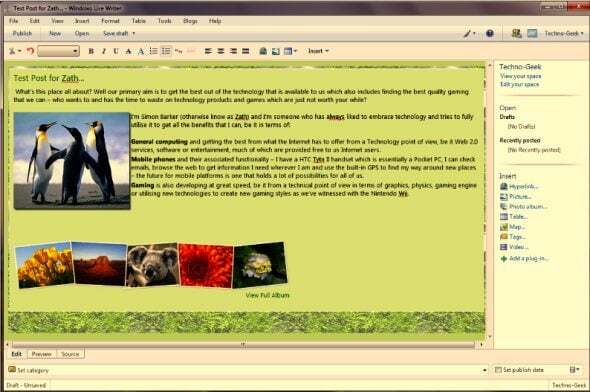 You can create a standard e-mail, photo e-mail and even events and news messages. 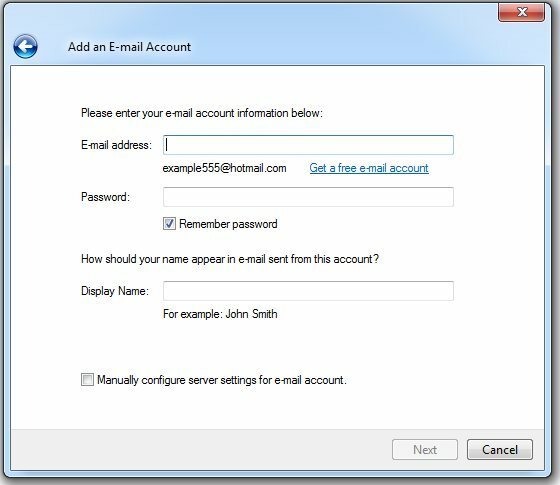 Also, Windows Live Mail isn’t just limited to Hotmail accounts – it can handle any e-mail server with POP3 or IMAP capabilities. I tested the application with a Hotmail account, a Gmail account and my e-mail account given to me by my ISP, all of which worked a treat. 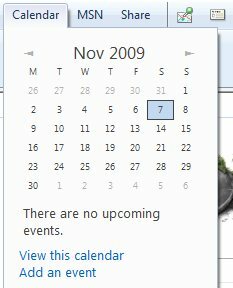 The calendar section of the application does what it says on the tin, and it does a good job of it. You can have various calendars on the application, and give each calendar a separate colour to distinguish it from the others, although some of the colours are rather similar to each other, so if you have a lot of calendars to organise, you may not know at a glance which is which. You can choose to view your calendar in 3 different views: day, week or month and to create a new event, like in the mail section, you just have to select “New” from the menu list and select “Event” from the drop-down list that’s presented to you. The contacts section of the application opens in a separate window, which I thought was quite strange considering the other sections open in the same window…The contacts window is split into 3 sections. On the left-hand section, you can view your contact groups, and your individual contacts appear in the middle section of the window. If you select a contact, you’ll see a more detailed view of their information. 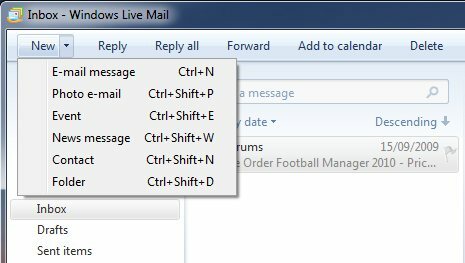 If you use a Windows Live account, you can import your contacts from your account which is a big time saver, especially if you have a lot of contacts! 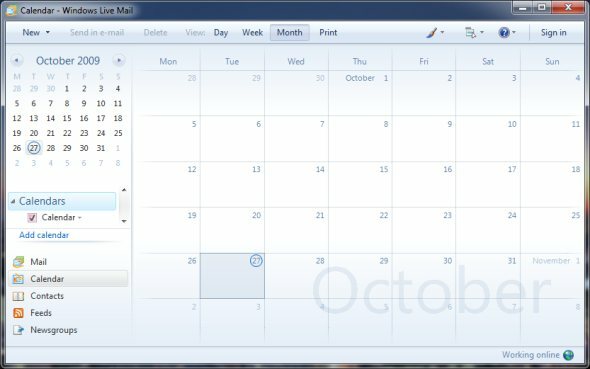 Overall, I like the layout of Live Mail, although the way it integrates your e-mails, calendars and contacts in to one application seems a bit annoying to me, as I like to use Thunderbird for my desktop e-mail client, so if I want to use the calendar or contacts, I’ll have my email on two applications. Despite this, I find the application easy to use and navigate around, and it’s a welcome change from the old Address Book found in Windows XP! Windows Live Photo Gallery is Microsoft’s photo editing application that comes as part of the Windows Live Essentials download and I must admit that I really like it. It features everything that the average consumer needs, covering everything from tagging someone on a photo to basic editing features such as red-eye removal. What I like about Photo Gallery is the fact that it doesn’t try to be Photoshop, it’s good as a basic photo management application, and doesn’t overly complicate things — you don’t need to be a professional photographer to find your way around or make your photos look great. When you view a folder of photos, they’re presented in a grid view, with a slider adjusting the size of the thumbnail previews. You can view your pictures in a few different ways, as you’d expect from any decent photo management application. Photos can be viewed by folder, the date that it was taken or by a person, using the “People Tags” feature which I’ll come to in a bit… The pictures in your library can also be rotated clockwise or anti-clockwise and you can even export selected photos, either to a DVD or Live Movie Maker. 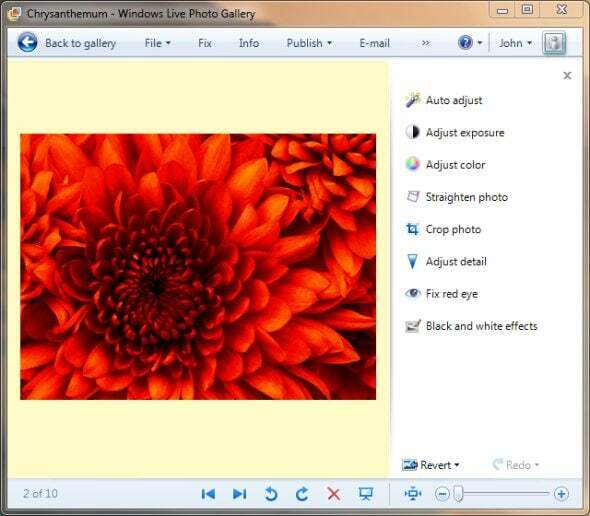 If you select any photo, it’s displayed in the entire window, with a menu to the top and side. From here, you can utilise any of the editing tools available by selecting “Fix” from the menu bar at the top, which displays the editing tools on the right of the photo. At the top is an “Auto Adjust” feature that will automatically adjust exposure and colour for you. This is a great feature for the average user who takes a ‘point and clicks’ approach to photography and still wants good looking shots. If you’re more of a perfectionist, you can, of course, alter the colour and saturation yourself, amongst other things such as red-eye removal. Another feature I was pleasantly surprised to come across was “People Tags”. If you want to view your photos by person, you can tag people from your photos. 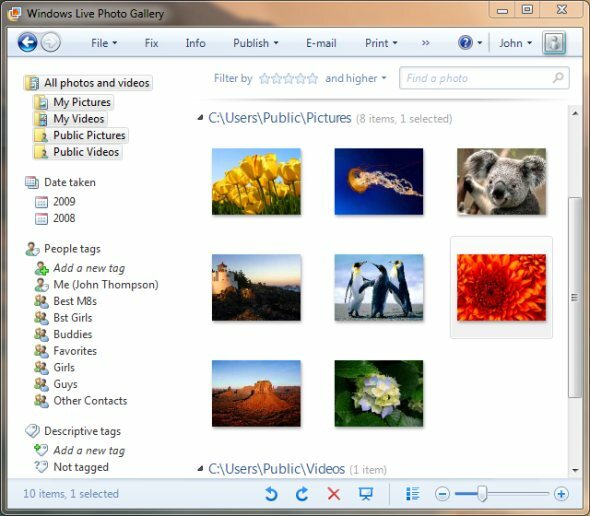 Like many Live applications, Photo Gallery takes your contacts from your Windows Live account and allows you to tag people from your contacts list, or manually type in the name of the person in the photo. When you have enough photos, it’s quite nice to browse via person rather than an event. As much as I like this feature, it doesn’t feel quite as polished as some other applications such as iPhoto on the Mac, which comes with face recognition technology which works surprisingly well. Despite this, the feature is a welcome addition. The final feature I came across was “Photo Stitch”, which allow you to ‘stitch’ together many photos to create a panoramic shot. It’s a nice feature to have, but not one that I’d use often, although I’m sure many people out there will appreciate its inclusion. My overall opinion of Windows Live Photo Gallery was a very positive one and is a great addition to a standard Windows 7 installation. It’s not lacking features you’d expect to find in a basic photo editor, and it includes more advanced features that you wouldn’t find in many other free alternatives, such as people tagging and photo stitching. You may want to compare other alternatives, such as Google’s Picasa to decide which works better for you, but I recommend that you give Live Photo Gallery a try before rushing to a decision. 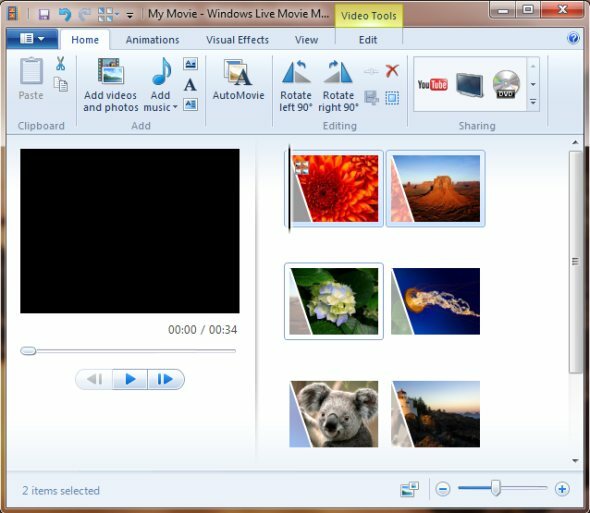 I’ve always liked Windows Movie Maker – a simple video editing application that was bundled with Windows XP, and at the time, very impressive. In the 5 year gap between the release of XP and Vista, however, Windows Movie Maker started to show its age, and it’s re-appeared on the scene with Windows Live Essentials. If you’re using Windows XP, you won’t be able to download Movie Maker as part of the Live Essentials package — you need to be running either Windows Vista or Windows 7. Previous versions of Movie Maker were very focused on movie making and only movie making (hence the name…) but the first thing I noticed is that there seems to be a shift in focus in the creation of Live Movie Maker. Most of the editing tools found in the older version of Movie Maker have been brought forward to the Live version and been given a facelift in the process. 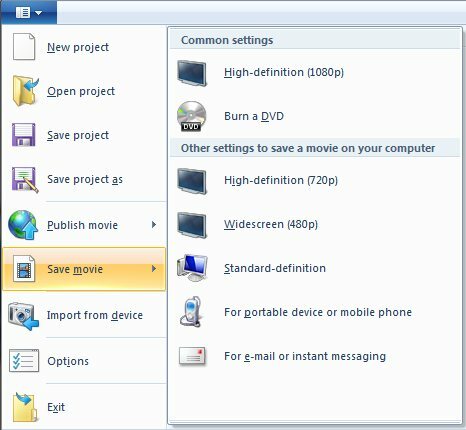 As with all the Windows Live Essentials applications from Microsoft, navigation is handled with the ‘Ribbon’ interface, which is much simpler than the GUI found in the old Movie Maker — everything seems much more organised and features are easier to find. When you’re in Movie Maker, you’ll find everything in 4 tabs. The first tab is ‘Home’, where you’ll be able to add photos, videos and music to your project. When you’re done, you can export your project to a variety of formats, including the option to export to YouTube, which I found very convenient. In the second tab, ‘Animations’, you can add animations to your project, where you have the choice of a ton of animations and slide transition timing settings. If you want to add visual effects to the videos or photos in your project, you’ll find a lot of effects on the third tab, aptly named ‘Visual Effects’. Finally, you have the ‘view’ tab. Here, you can change the aspect ratio of your project between 4:3 and 16:9, as well as change the zoom level of the thumbnails on the project preview. When you’re working on a project, another tab appears which gives you even more video editing tools, including a trimming tool and audio track tools. One thing that I was very surprised at in Live Movie Maker is the glaring omission of a timeline! Streamlining an application for simplicity is one thing, but to make a video editing package without a timeline? It doesn’t make sense to me why they’d leave what was presumably a key feature of any video editing application out — I would have felt much more comfortable working with Movie Maker if it was complete with a timeline. Despite this, the variety of choices that are included, especially when choosing animations to go between videos and pictures is plentiful, and a great addition to go along with the sharing options which include 720p and 1080p exporting choices, as well as the previously mentioned YouTube option. For a free application, Live Movie Maker does a good job of the editing and exporting process, although I still prefer iMovie by a country mile, as it feels more complete and feature-filled than Movie Maker ever did. However, for the 90% of you out there using Windows, Live Movie Maker is a good addition to your computer and one which you should check out when you get the chance! If you run a blog of your own, you may be interested to know that Windows Live Essentials ships with a very capable blog editor called Windows Live Writer. 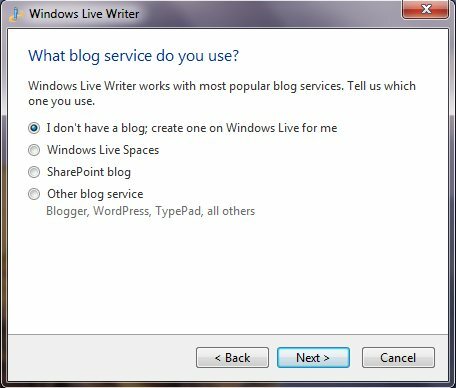 When you start Writer for the first time, you’ll need to set Writer up to publish to your blog, and that’s virtually any blog service you may use not just Microsoft’s ‘Live Spaces’. You can set it up to publish to Live Spaces, SharePoint and ‘Other blog service’ which includes Blogger and WordPress. Once you’ve selected whichever applies to you, just input the requested information and hit next. For a service like WordPress, you need your URL and username/password, whereas, for a Windows service like spaces, you just need your Windows Live ID and Password. When you’re all set up and ready to go, you’re presented with a clean and easy to use interface that isn’t overly complicated, but manages to put everything that you need in plain sight — Writer is one of the few Live applications not to feature the new Ribbon interface you’ll find in almost every other Windows 7 application as well as the upcoming Office 2010. Up front and centre, you’ll find the blog post or at least a preview of what it will look like when you’re done playing around and publish it. On the sidebar to the right of your post, you can insert various features into your blog post including maps, videos, pictures or complete photo albums. Many features you can import are pretty standard, but I love the way the photo albums are displayed in particular. When you select an imported feature such as a photo album or map, the sidebar to the right changes to a settings panel for the selected item. When the photo album is selected for example, you can choose the album style and the text wrapping to alter how it looks in the post. If you can’t find anything to your taste in the default options you can select to ‘Add a plug-in…’ at the bottom of the sidebar and choose from a host of downloadable extensions from Microsoft’s website. You can even download plug-ins for social networking platforms such as Facebook which was great! Apart from the special additions that you can insert into your blog, Writer does everything you’d expect from a very basic word processing application with the option to post what you write to your blog. A feature I found quite useful was the ability to manage multiple accounts for people who have various blogs, and need to manage them off one application, which simplifies things considerably. Overall, I found working with Live Writer to be the best desktop blogging experience I’ve encountered — creating and editing the posts themselves was simple and intuitive, helped with the tools presented clearly to you on the right-hand side of your post without having to dig through menus to find everything! 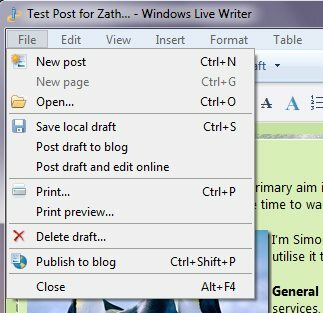 I’d recommend Windows Live Writer to anybody wanting to see what all the fuss about blogging is for themselves, and even those who are already experienced with blogging. Don’t download it expecting anything magical that will make you jump up and down in excitement, but as a free blogging tool to add to your Windows 7 installation, Writer does its job very well. Internet toolbars… I’ve never liked them, and always associate them with two words: useless and malware. So what makes Live Toolbar different? Well, apart from integration with every other Live application, not a lot. For some reason, Microsoft felt compelled to give you another search box to go along with the one you already have in the top corner of IE, which is utterly pointless and tends to get in the way a bit. Another gripe I have is the fact that you need Internet Explorer to use the damn thing, which puts me off straight away — I much prefer Firefox or even Safari to Internet Explorer, and unfortunately for Microsoft, a toolbar isn’t going to change that! Despite the annoyances, I did find quite a few notable features that I actually didn’t mind quite liked. When you open IE, the toolbar is at the top of the window with the search function located on the left-hand side. To the right of that, you’re presented with a selection of buttons. The first two: ‘What’s new’ and ‘Profile’ don’t offer any surprises and just send you to another webpage, but after this, things get a little more interesting with Live integration. If you select the ‘Mail’ button, you’ll get a nice little drop-down window below the button which displays recent emails and offers a link to your inbox. If you don’t run Live Mail on your system, this is a great tool to check recent emails and go straight to your inbox. As well as this, I like the ‘Calendar’ button which gives you a quick look at your recent entries and gives you the option to go to your calendar or view an entry by clicking on it. 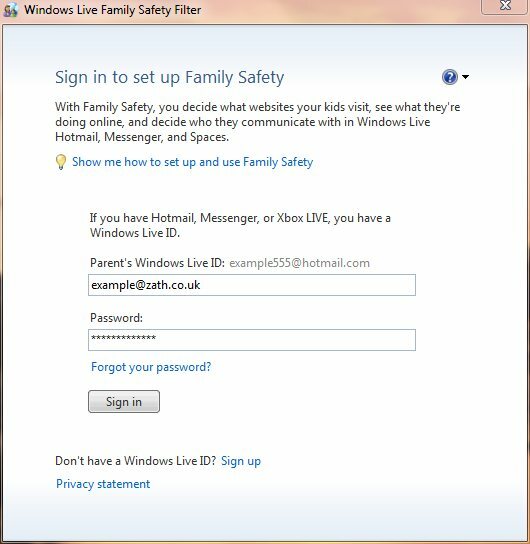 For those over-protective parents out there, the final Windows Live Essentials application I’m taking a look at is Family Safety. Personally, it looks like more hassle than it’s worth, especially considering that Windows 7 and Windows Vista both have Parental Controls built in that work very well! If you use the Parental Control’s in Vista or 7, you can already stop the kids from using certain applications, going on the computer at certain times and applying a web filter. If you’re running Windows XP, or just want to be extra sure, then setting up Family Safety is simple, if not a bit time-consuming. Every person you want to restrict requires a Windows Live account, which needs to be set up if they haven’t already got one before you can use Family Safety. Once everything is set up, you can view activity reports for anybody you’re currently monitoring, add children or add another parent. You can configure family safety to limit the searches that children can perform, restrict certain sites and even decide who they can talk to on Live Messenger (overkill? ).